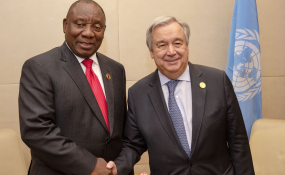 President Cyril Ramaphosa meets with the United Nations Secretary General António Guterres of the on side-lines of the 32nd Ordinary Session of the Assembly of the African Union Heads of State and Government in Ethiopia. South Africa's foreign policy positions will be closely examined as it begins its third two-year term as a non-permanent member of the UN Security Council. Its two previous terms - in 2007-8 and 2011-12 - were not great successes. If anything, they actually diminished its global standing, due to its reluctance to censure a number of egregious human rights abusers. Another problem was the confusion surrounding its policy on the Libyan crisis. This time around, Pretoria must show greater diplomatic finesse and less ideological inflexibility. There are two interrelated objectives throughout its tenure. One is to advance African interests within the international system. The second is reform of global governance to more accurately reflect the demographic realities and power distributions of the 21st century. This is particularly true of the Security Council itself. Those are familiar and relatively uncontroversial aspects of South Africa's foreign policy discourse. But, if not carefully managed, this agenda could be encroached on by a number of wider issues that could undermine its interests. Two particular diplomatic icebergs stand out. First, South Africa must not become enmeshed in the great power rivalries currently disfiguring the Security Council. A range of contentious issues are likely to come before the body over the next two years. These will bitterly divide Western capitals and Russia, as well as Washington and Beijing. South Africa's principal investment and trading partnerships are still with Western states. But it's also a member of the BRICS forum, whose two main powers, Russia and China, are competitors - if not outright adversaries - of the West. Pretoria must somehow straddle these divisions and not allow them to define its own foreign policy. Where it does take a clear position against one or other power bloc, it should do so circumspectly, without any rhetorical grandstanding. Its foreign policy needs to be more mature and nuanced than a partisan alliance with a particular bloc. There may even be scope for a modest reprise of the country's global bridge-building role from the 1990s. This saw it play a leading role in brokering solutions to vexed issues. An example was the renewal of the Nuclear Nonproliferation Treaty in 1995. Today's global environment is much less conducive to such diplomatic activism. But seeking solutions and staking out common ground - the role of the good global citizen - is still a worthwhile endeavour. It will help in enhancing South Africa's global standing. This contrasts with the ideological shrillness which characterised policy under former presidents Thabo Mbeki and Jacob Zuma. Their approach contaminated relations with the West, to whom Ramaphosa is now looking for the bulk of the US$100 billion in investment he is seeking. The promotion of human rights and democracy on one hand, and a vigorous defence of state sovereignty and non-interference on the other, is one of the most contentious fault lines of 21st century global politics. Since Mbeki's presidency began in 1999, South Africa has steadily gravitated away from former President Nelson Mandela's commitment to an ethically based foreign policy. It has also not played any meaningful role in advocating for human rights and democracy. In its previous terms on the Security Council, the country supported very rigid definitions of sovereignty and non-interference. It denounced pressure for change in Zimbabwe, Sudan, Myanmar and Uzbekistan as interference or the promotion of "regime change". It did not pass unnoticed that the country's defence of authoritarian regimes stood as an affront to the ruling ANC's own history. During his recent visit to India, President Cyril Ramaphosa committed Pretoria to a foreign policy prioritising human rights and democracy. But, its diplomatic behaviour since 2018 provides meagre evidence for this. In January 2019 alone, Ramaphosa failed three major tests. First, Pretoria's response to the recent round of repression in Zimbabwe has been muted to the point of indifference. It chose to merely monitor a rapidly deteriorating situation. And, as previously, was unwilling to apply pressure for democratic change. Second, Ramaphosa endorsed the recent election outcome in the Democratic Republic of Congo, which gave victory to Felix Tshisekedi. This, despite evidence from the Catholic church's 40,000 strong observers and data leaked from within the electoral commission itself suggesting that Martin Fayulu had secured a decisive victory. Finally, South Africa continues its steadfast support for the regime of Nicolas Maduro in Venezuela. This, instead of a more balanced approach in which the defence of constitutional values and democratic institutions takes precedence. Although Ramaphosa's presidency is still in its infancy, these positions don't support the idea that he represents a decisive break with the past. In practice, he continues the established policy of subordinating democracy and human rights to solidarity among former liberation movements, and with African governments. But the biggest drag on his foreign policy ambitions - as in the domestic arena - is the ANC itself. The party remains steeped in the hackneyed Cold War discourse of "anti-imperialism" and a visceral anti-Westernism within which it crudely frames all global issues. It's difficult to see how a leader elected on so fragile a mandate, to lead a party with such a vociferously anti-Western base, will be able to recalibrate South Africa's policy to any significant degree during its tenure on the Security Council.